BEIJING, Sept. 2 (Xinhua) -- Chinese President Xi Jinping and South African President Cyril Ramaphosa held talks on Sunday ahead of the 2018 Beijing Summit of the Forum on China-Africa Cooperation (FOCAC), agreeing to elevate the comprehensive strategic partnership of the two countries to a new level. Xi noted that China and South Africa have valued sincerity, friendship and mutual trust. He also welcomed Ramaphosa's visit and co-chairing the FOCAC Beijing Summit, believing this will inject new impetus into the development of China's relations with South Africa and the continent. Xi stressed that the significance of the relationship between China and South Africa has far exceeded the bilateral scope and is of global and strategic influence. Since the establishment of diplomatic ties 20 years ago, the two countries have been committed to mutual respect, trust and benefit, and have always understood and relied on each other, said Xi. Xi said the two countries should advance toward the major direction and target that have been established, actively implement important consensuses they have reached, make strategic plans for the bilateral cooperation in the next 10 years, strengthen high-level exchanges, deepen political mutual trust, promote practical cooperation and enhance inter-party and people-to-people exchanges. Xi also called for concerted efforts to make the China-Africa cooperation flourishing, make the BRICS cooperation stronger and better, closely communicate and coordinate within multilateral frameworks, protect the legitimate rights of developing countries, promote democracy of international relations, propel the international system and international order to develop in a more equitable and reasonable direction. 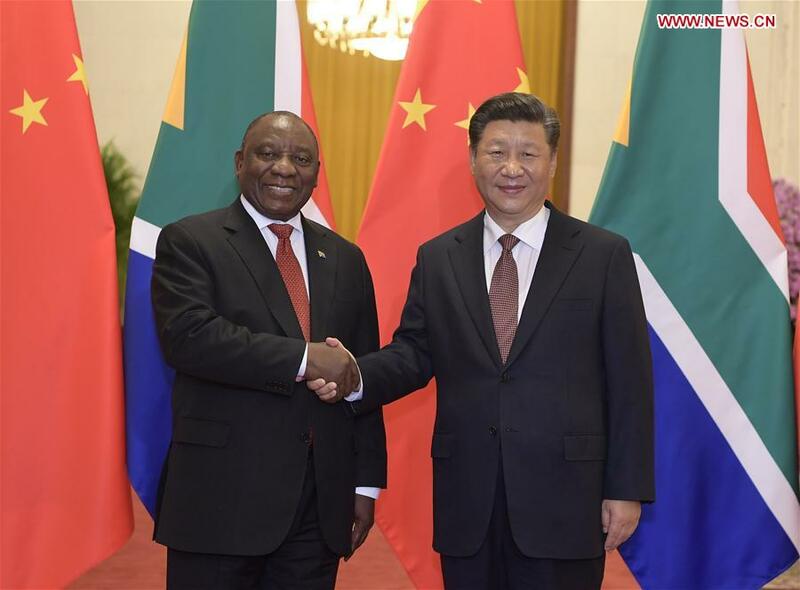 Ramaphosa said the relationship between South Africa and China has been set up on the basis of equality, mutual respect and benefit, adding that it is unfading and strategic. "I am very happy to visit China for the first time as the president of South Africa and continue our strategic communication," said Ramaphosa, noting that keeping high-level exchanges between the two sides is very important to deepen mutual trust. South Africa is willing to learn from China's valuable experience in areas including ruling party building and corporate management, and will actively participate in the Belt and Road cooperation, said Ramaphosa. Ramaphosa called for concerted efforts in upholding multilateralism and international trading regime, and safeguarding the common interests of emerging markets and developing countries.